Gilder Lehrman Collection #: GLC02656 Author/Creator: Fagan, James Fleming (1828-1893) Place Written: Fort Smith, Arkansas Type: Document signed Date: 18 December 1874 Pagination: 7 p. : docket ; 32 x 20 cm. Summary of Content: Also signed by Andy McDavid and J.H. Lauderback. James Churchill and J.W. Harrul signed as clerks. John Speaker signed as a witness. Fagan, as the U.S. 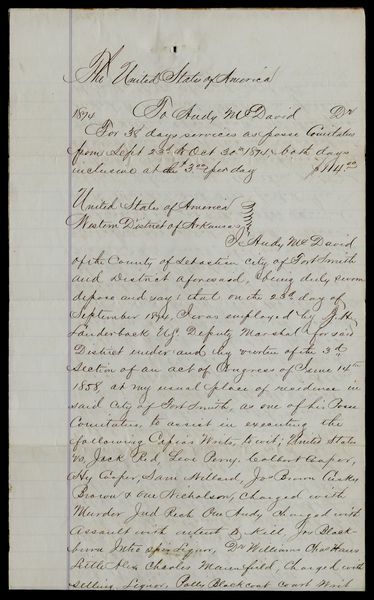 Marshal for the Western District of Arkansas, authorizes J.H. Lauderback to hire Andy McDavid to enact several arrests as a member of his Posse Comitatus. McDavid hired to arrest persons in the Indian Nation for murder, assault with intent to kill, open liquor, selling liquor, and larceny. McDavid details his travels through parts of Texas and Arkansas to perform arrests. Successful arrests include Polly Blackcoat and Andrew Jackson, known as "Our Andy." Lauderback states that employment of a Posse Comitatus is necessary; Fagan verifies Lauderback's claim. Background Information: Lauderback and Speaker serve as witnesses for Fagan's statement. Posse Comitatus enabled Lauderback to summon able-bodied citizens to maintain public order.